An early stage social enterprise requires lots of support and hand holding to effectively create the sustainable impact it aspires to create and reach a scale where it is able to attract risk capital in the form of venture or angel funding. Given the social and cultural diversity of India, even well established social enterprises struggle to attain sustainability and create impact while expanding geographically. To make these struggles easier to fight through, collaborations that create community trust and provide a foothold are necessary. Such collaborations with existing players in the social development ecosystem can accelerate the processes of understanding the consumer need, internalizing the community expectations, setting up the operations and scaling up in a sustainable manner. With this in view, CIIE in collaboration with Deutsche Gesellschaft für Internationale Zusammenarbeit (GIZ) launched a pioneering series of Network Expansion Workshops in 2013. These workshops are aimed towards building a vibrant and active regional ecosystem of support organisations (organizations that can support an entrepreneur – includes NGOs, foundations, location community networks, government bodies, academic institutions, etc) and social enterprises. 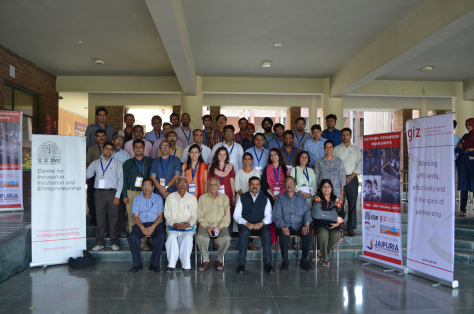 The Jaipur Workshop – organized between Oct 16 and Oct 18, was the fifth workshop in the series of these Network Expansion Workshops – the first four being held in Ahmedabad, Coimbatore, Varanasi and Jamshedpur. Rajasthan, although known for poor resources, desert landscapes and water distress, is actually an extremely rich in entrepreneurial energy. The State is part of the 8 Low Income States (LIS) of India and at the same time is home to founders of some of India’s largest corporate houses of India and the world like the Aditya Birla Group, Arcelor Mittal, Piramal Group, Future Group of the Biyanis, Bajaj Auto and Bharti Aitel, to name a few. Furthermore, Rajasthan is also home to some of India’s most successful and reputed non-profit organisations and foundations like Seva Mandir, Jaipur Foot, Jaipur Rugs Foundation, Barefoot College, Jal Bhagirathi Foundation, among others. The absence of natural resources and a vibrant development sector have actually contributed to limiting the entrepreneurial energy of the State. Entrepreneurship has been confined to the more traditional business sectors like jewellery exports, mining, stones, small and medium manufacturing, fabrics, garments and more. As a result, the mindset to promote social entrepreneurship and to solve some of the primary social and environmental challenges of the state in areas like water, waste management, energy, agriculture, have been ignored or kept at a bay. CIIE is working actively with RIICO through Startup Oasis to catalyse high growth entrepreneurship in Rajasthan and is actively strengthening the ecosystem in this region. A workshop in Jaipur therefore made perfect sense. Generously hosted by the Jaipuria Institute of Management, the fifth Network Expansion workshop attracted some of the major support organizations including Morarka Organic, Pratham Education, Reliance Foundation, Jal Bhagirathi Foundation, Design Innovation and Craft Resource Centre (DICRC), LNMIIT, LM Thapar School of Managment and many others. 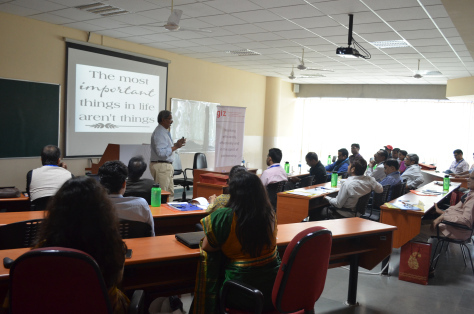 The first day of the workshop was kick-started by Prof Ravi (Snehanadnad) Sinha, who spoke about the differences between a regular for-profit business and a social enterprise and established the needs of social enterprises. The goal of the first day was to sensitize these support organizations about the needs of a social enterprise through a combination of lectures, interviews and case based discussions. Mr N. K. Chaudhary, CMD of Jaipur Rugs was next, who talked about his journey as a successful entrepreneur and helped the support organizations understand the different ways in which they can help a social entrepreneur. He emphasized the need of having a high – degree value system and empathy in order to be successful in this domain. 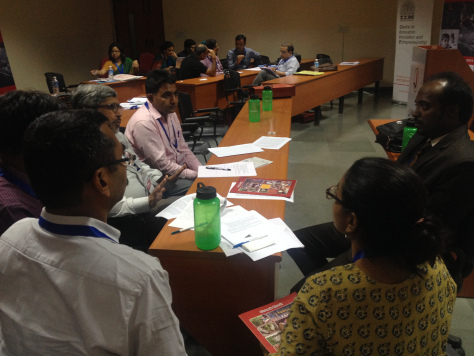 Post lunch, CIIE team along with Dr. Sheenu Jain worked with the support organizations and helped them discover their existing capacities and strengths by detailing out the various kinds of support they could offer social entrepreneurs. In order to put a real world spin to this session, three social entrepreneurs including Jaydeep Mandal (Aakar Innovations), Lokesh Makam (Barrix Agro Science) and Harish Manwani (Sarvajal) were invited to facilitate a case based discussion on how the social enterprises could support these entrepreneurs. This day gave the supporting organizations a peek into the lives and needs of a social enterprise through various modules. Day 2 formed the crux of the Network Expansion Workshops. With the support organization now aware of the support they could provide to the social entrepreneurs, we invited over 16 social entrepreneurs from in and around Jaipur. These entrepreneurs are involved in solving various challenges including providing healthcare access to people from rural Udaipur, an e-commerce portal for organic produce, developing sanitation solutions for urban poor from Delhi, rural / agri tourism in the heartlands of Rajasthan, and more. 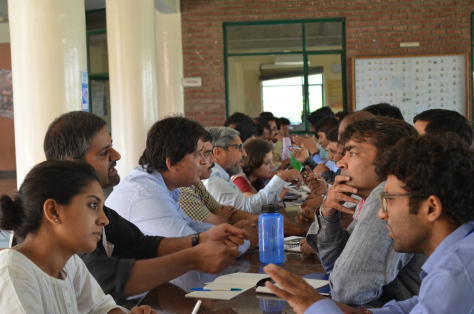 The social enterprises and support organizations interacted over a speed dating session where each organization had only 2 minutes to pitch to the other organization. Over a grueling period of 1.5 hours, the participants were able to figure out synergies with each other and set aside 30 minutes for detailed meetings with each other later. These one on one meetings were set up for the participants all through the afternoon until 6 PM. While day 2 ended for support organizations after these meetings, the workshop had only begun for the social enterprises who would spend the rest of the evening and the next day in understanding how principles of design thinking can be applied to create a stronger value proposition for their businesses. Day 3 started with a warm up session of brief meditation by Kunal Gupta and Dhaval Shah. 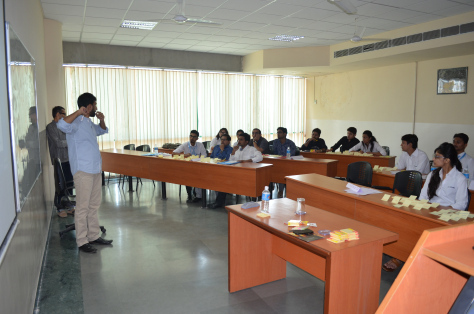 The participants initiated the design thinking process through a role-playing session on ‘Swach Bharat Abhiyaan (SBA)’. Some of the interesting stakeholders of the SBA identified themselves as film-stars, farmers, schools, labourers, ISRO, ‘babas’, and even mafia. The interesting thing about this approach was that within a short span of 3 hours, the groups were able to translate abstract concepts into workable ideas or solutions that had an ability to monetize the SBA. Following this, the social entrepreneurs reviewed their businesses again through the five stage design thinking framework of empathize, redefine, ideate, prototype and test and develop deeper insights into their current operations. Ultimately, the workshop was not only about identifying regional resources and channelizing them, but also an effort to take proactive steps to align the visions of all the stakeholders and build a much stronger regional ecosystem of partners. The Jaipur workshop in that respect has created a strong network of organizations and entrepreneurs who will add significant strength to the social ecosystem.